British Heavyweight Boxer. On twitter, Anthony said he stood at an imposing "6 ft 6" inches tall. In this photo, he had about 0.3 inch more sneaker than me. He's legitimately 6'6. I met him a few days ago and I'm 6'6 and a half and I was ever so Slightly taller than him. He's definitely 6'6. Rob, can you add Jarrell Miller? His 6'6" claim is perfectly fine. He's closer to that than 6'5". Plus, there are 6'5" who claim 6'6". There are 6'4" who also claim 6'6". AJ isn't one of them. Maybe not military posture, but he does have damn good posture. He has almost perfect military posture. Rob, would you say AJ has the ‘best posture’ of all the people, you’ve met? I'm sure there are people who stood better than Joshua, although when he's walking and standing he does have a very tall look to him. If you paused the video at the point I mentioned he was only 20 quid, you can see he was there between 11am and 3pm and I think roughly lunchtime. He did another group shot afterwards, went back to signing and away by 3pm. Yes I agree. Right now I believe he could be anything between 6'2.5 and 6'3.5. I am leaning to 6'3+ but those massive boots (with who knows what in them) and big head make him hard to figure at the moment. Hopefully they have a barefoot stare down at the weigh-in. Yeah the FIrst Time Miller and Joshua Stared down, I thought Miller was only 6'2.5", but the second and third time he looked taller. Miller has an absolutely MASSIVE head though. Could make it difficult to figure him. Whyte is about 6'2.5. Joshua's next opponent, Big Baby Miller looks to be about 6'3 or 6'3.5. It was hard to tell because he had big combat boots on at the presser and may have had footwear advantage on Joshua. So basically because of Anthony Joshua's high eye-level, he can look taller to a lot of people. Rob, if a 6'5 7/8" guy (in winter boots) was standing beside Anthony Joshua, what would the difference look like? It depends on what Joshua is wearing, but he has the benefit of a great physique and highish eyelevel. Anthony Joshua 6'7 out of bed NOT believible ? He had footwearadvantage - about 1.5cm - over Greg Davies on Graham Norton Show last night. Greg looked easily two inches (plus) taller before the staredown. AJ was stretching and maybe tip_toeing during the staredown and at one point the difference was about one inch, but then GD straightened up and cleared him by two inches. I think AJ would be 2.5 inches shorter than GD if they were barefooted. Looked every inch of 6'5.5 - 6'6 last night on the Graham Norton Show, especially when he stood face-to-face with 6'8 Greg Davies. Not impossible AJ is close to 6'7 out of bed. Given his weight & size he could lose a full inch through the day. @Rob: in sneakers based on how you saw him that would be extremely likely if he’s 6’5.75 he would be either the full 6’7” or slightly over or maybe 1/4” under which he would round up. Yes it was seen a while back, 6ft 7 in sneakers is very believable. AJ looks 196ish due to the footwear advantage, but there is enough evidence that he's at least 197. Rob, I feel as if him and Derek Theler are almost exactly the same height, and of similar proportioms , ofc AJ is a lot bigger and heavier, do you still think Theler would have the edge? @Rob: what time of the day did you meet him and take the picture? I don't have timetable saved, but it was I believe around lunch range. Rob, how tall did he look to you, without considering AJ's footwear advantage? Joshua never looked any less than 6ft 6, I'd have said a more solid version but there was enough sneaker differnece I think to say he might measure under it a little. Don't you think that AJ looks a legit 6'6 with 194-194,5 Ibrahimovic and 189-190 Tony Bellew ?? In the pic with Rob if we adjust for his lean and the footwear advantage AJ has that puts him somewhere right in the 197cm range. May not quite be the full 6’6” like Faggerbakke or Wilder or Carmelo Anthony or Baron Corbin but he’s not less than a weak 6’6” based on Rob’s estimation of footwear and the pic. Very much over 6’5”. @Canson: When you say easily over 6'6, how tall do you mean? If you were to stand Deontay Wilder and Joshua together, how much taller do you think Wilder will be? My guesses are, Wilder is 6'6 at night, just under 6'7 in the morning, Joshua is 6'5.3 at night and 6'6 flat in the morning maybe a paltry amount more, and Tyson Fury is 6'7 at night and 6'8 in the morning. I always use near my morning height, 6'7.25 is not my night height, it's 6'6.75, when I get up I'm probably 6'7.75 haven't checked though. If I'm very lucky I'm 6'9 in shoes, near when I get up obviously. Dillian whyte’s height anyone? He’s listed at 6’4 but is clearly shorter than that. Would say 6’2.5-5’3 anyone agree ? Joshua is 6 foot 6 when he wakes up , period . Hi tall guys, just a question for us. I’ve seen Joshua pictured with Prince Charles (UK) in these days. If we assume that the Price is 175 now, in the pictures the difference between them is less than 10 cm... How can we assume that Joshua could possibly be 197.5 barefoot... maybe with minimum 5 cm. sneakers on... I think every star puts 5 o 6 cm. more on their schedule. Everyone should be measured BAREFOOT and nothing more. Even Wilder or Fury. I assume they are minimum 5 cm shorter than listed. Or am I wrong? I take it you mean These Photos. He's still a few inches taller than Charles, whilst Charles is on a higher step. Wilder should be at the very Least 6'6". Fury was listed at 6'7 once , I doubt he could be much taller than that. He sometimes looks 1/2" On Wilder and others over 1" so it's really weird with these two. If I was a betting man I'd say Wilder safely clears 6'6" and is likely the 6'6-1/2" in the early afternoon hrs. Fury yes could be over 6'7 but not by much as he was once listed at 6'7" even. @Ellis: 🙏. I must say that Wilder shows a 6’6.5 measurement. However, we don’t know what time of the day. We also see that he doesn’t quite look as tall as Carmelo. Melo isn’t much more than 6’6-6’6.25 range himself. I have them the same size as the camera angle favored Melo imho. @Canson: I'm starting to see that Fury is more 6'7.25, and Wilder might just be 6'6 flat you really hit the nail on the head with that prediction. For Deontay he can be anywhere from 6'6 to 6'6.25, I just think that 6'6.5 is a bit too high, but it's close enough i guess. l used to think that his father's only 6'1" because I assumed that Joshua was barefoot in that pic. But apprarently that isn't the case. 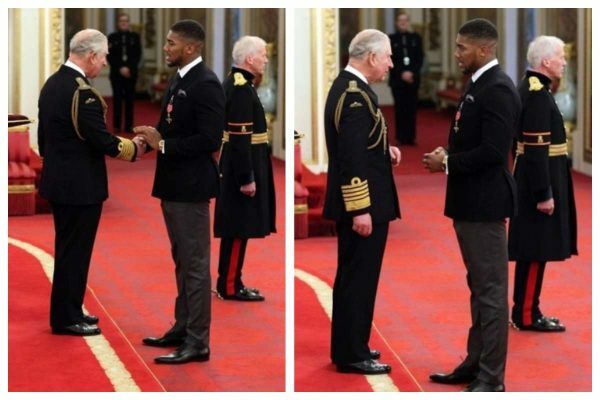 Anthony Joshua is a little bit in front of the camera, but his father does have a footwear advantage, if they were standing straight together the difference would be 3.75 considering that if they were shoulder to shoulder Joshua's fathers head would hit a little above Anthony's eye brows. Not considering the footwear the difference is 3.75. Considering the footwear the figure is more like 4 inches, I'd say Anthony Joshua is 6'5.5 and his father is 6'1.5. @Christian: Just curious you never really clarified how tall you think Anthony Joshua is in the picture if you believe his father is 6'2, how tall do you think Anthony Joshua is in the picture? Klitscho claims he’s 6’6”(and he probably is in the morning and close to it in the afternoon) so maybe his stare down with Joshua in the Netflix was during the afternoon at his bes and Joshua’s worst. He looked about the same height as Klitschko who’s just over 6’5”. So I’m gonna say anywhere from 6’5.5-6’6”. They don't seem like there's much between them, although I'm not sure about what ground or sneaker/shoe they have. Rob, recently, my best friend (The one who would be slightly taller than John Cena) said there 'was' an eighth grader (in our former middle school) who was big. He said that the same 'eighth grader' was somewhere between 6'5"-6'6". I asked him if that 'former eighth grader' was the same size as Anthony Joshua. (I showed him the picture of you and Anthony Joshua.) My best friend said yes, the eighth grader was as big as Anthony Joshua. His dad looks an easy 6'2" and may have been more in his prime. His father could be about 6'1", if he wore shoes and if AJ was barefoot in that pic. His father's around 6'2" based on that pic. Rick1: Looks to me like his father is 6'2. Height difference between the two of them seems to be 3-4 inches but I am presuming his father has a footwear advantage because AJ in in nearly flat boxing shoes in this photo. How tall would you say his father is looking at this photo ? They are both wearing shoes , I’m thinking 6’3?? The images Christian provided indicate around a 5 inch difference between him and Povetkin with decent angles. @Canson: Indeed, in quite a few photos it can seem 4.5 or so but I doubt it (but I could be wrong). 4 inches is a reasonable difference between the two. If AJ is 6'5.75 then Povetkin is would be around 6'1.75. In Christians pic Joshua looks easily 5in taller than Povetkin, which cant be right. Just look at the weigh in video, where they are on even ground, same footwear, with perfect camera angle, the difference is not over 4in. You may even look Povetkin vs Price weigh in, Povetkin is only 5in shorter there. Both are wearing socks Click Here The socks that AJ wore look like shoes but they aren't. @Robbe, I agree. It seems to me there is a 3.5-4 inch difference between AJ and Povetkin from what I've seen. It may be closer to 3.5 inch as AJ has a smaller than average eye to head level for someone of his height range. Although in many photos there looked to be a 4.5 difference between the two. I've seen enough of Povetkin to believe he would measure in 6'1.5-6'2 range. AJ is not over 4in taller than Povetkin. More like 3.5in. Povetkin is wearing only socks there. Is AJ wearing sneakers? Or are those some kind of socks? If those are shoes, the difference is less than 3.5in. Klitschko was wearing lifts and AJ wasn’t even wearing shoes in the face off at the weigh-in. AJ is about 1cm taller than Wlad and it was noticeable at the face off in the ring when Klits wasn’t wearing lifts for once in his life. I think Price actually looks substantially taller than AJ in that photo. I think Povetkin looked the full 6'2" next to AJ. Not over it though. Does he really look close to 6’6” with circa 6’2” Michael Phelps here? I would guess 4 to 4.5 inches between Povetkin and AJ. If I had to pick I'd go with 6'1.5 for Povetkin. I would say Povetkin is legit 6'2 or close enough to not argue it, It looks around 4' difference in the staredown. Joshua is taller than Wlad, but it's not a full inch. klitschko was 4-5 cm taller than joshua on staredown. 6'5.5"/197cm In 0.8inch boxing shoes he is likely a solid 6'6" at worst. Holyfield (6'1.25) and Povetkin are quite close in height on a few different pics I found online. I would give Povetkin the very slight height edge after reviewing multiple photo's. Click Here I do think Rob has Joshua listed correctly at almost 6'6. Price looks 6'8 range to me. Povetkin is a legit 6'2 i think. He was roughly at Price's eyelevel at their staredown. That pic shows clearly Price is not 6'9. Looks nowhere near 3in taller than Joshua. i dont know if this really means anything to anybody but i just watched an interview between Kugan Cassius and AJ where AJ gave his top 5 heavyweights of all time and during the interview, AJ referred to himself as 6'6 to 6'7"
Joshua and Alexander Povetkin at a recent press conference appeared to be 4 to 5 inches apart in height. Perhaps drawing some long bows here, but if you look at Kevin Pietersen with Rob, KP with AJ, and AJ with Joseph Parker, I do reckon JP seems like a good 6'3"
Elohel. Wlad looks shorter in some pics too. It is so close between them. Wlad can look anywhere from a inch shorter to a inch taller even with both standing decent in boxing shoes (no lifts). The height variation is extremely rare in most cases one looks clearly than the other. Joshua is taller than Wlad, but it's definitely less than an inch between them. Wlad admitted to being 6'5"
I honestly don't know where this assessment is coming from. Every time I see pics with him and Wladimir, they look the same height or Wladimir looks taller even. Unless Wlad is wearing lifts not sure how this is happening. Hell, in a pic with stormxy they looked pretty similar in height, with very little between them. I just feel people are getting caught up in the hype and inflating their stats. I notice that happens a lot, with wrestlers too. He seems the same height as Vladimir. Here in the UK we always seem to inflate the size and quality of our athletes (like the americans) he looks 6ft5.5 in boxing shoes. Amusingly enough I feel people will notice it more when the hype dies down. Still like him though...reckon him and wilder will be a good fight. @Rob: my apologies. I meant for Klitschko that he’s 6’5-6’5.25 at a low, not Joshua. I agree that AJ is near 6’6 like 197cm (6’5.5-.75) which is weak 6’6” but Klitschko looks closer to 6’5”. Good video rob..near 2 inches difference b/w Anthony and Kevin..Kevin 192-93 and Joshua 197 is a real possibility..
@Rob: possible but my guess is 6’6-6’6.25 out of bed and 6’5-6’5.25 at a low. Towards end of this video CLick Here - Anthony and big Kevin Pietersen. I mean in person I think Anthony is close to 6ft 6 and Kevin can't really be much less than 6ft 4 flat. You could still make an argument for Vlad to be near 6ft 5.5 like many guess him at...I wouldn't rule it out entirely. Depends how much looser his stance is, but it would be hard to imagine him as tall as 5ft 11. It's not believable he's over 6ft 6. Maybe he's more like 6ft 6, 7 (in shoes), that's at least believable. He clears 6'5." I don't why people think of AJ as 6'4." His 6'6" is more than reasonable since he's closer to that than 6'5." His fight with Wladimir was bloody raw! One of the best 'RRRAAAAWW' fights I've ever since. Rob, this isn't a height question, but what do you think of that match? Hey rob and fellow friends on celebheights, I was wondering rob if you could perhaps create a page on Daniel Dubois height? could you please , if you have time, give your opinion on his height, I believe he is only a centimeter over 6'4. He clears 6'5" easily, just look the pic with Rob and click it to see the height chart. Can you explain why you look obviously taler with Joshua by at least couple inches and he is listed taller than challenger 15? Joshua does look a bit taller than the challenger in person...his body frame helps that fact. The challenger doesn't have that big a head, which probably is a fraction less than Joshua (who has a normal eye but long eye-chin). Nah, AJ is certainly over 6'5. He is between 6'5.5 - 6'6 and i think the listing here is about right. In that picture with Courtois seems like Courtois had 1.5in advantage, Joshua can't be more than 6'5 at best judging by that photo because Courtois himself looks clearly shorter than 6'7 Peter Crouch so even he might not be a full 6'6. The height and reach over Parker was evident from the Start , but AJ Outboxed him honestly. AJ is a monster, keep in mind a prime George Forman was around 6'3 and 226 pounds ( In 1970's). Parker is actually bigger than Foreman was, and look how small AJ makes him Look. Boxers are certainly alot bigger today. ALi, Frazier, Liston all around 200 to 220 ( Liston being the Biggest in weight). Thats tiny in modern standards of HW. I guess AJ is 200cm out of bed and in the evening 197.5 cm tall. 6'3 Parker is about bang on yes i agree with the comment below. I don't see why boxers lie because it is so obvious in stare downs with those we know are pretty much telling the truth, easier for wrestlers to get away with it to the masses. During the weigh in face off, Joshua and Parker had the same type sneakers. I Hawkeyed their heels during the weigh in. Just the same. I've got Parker exactly at 6'2.6" inches if AJ is 6'5.75" To make it easier for you. Just go by the top of the ear and compare it to the top of the head for both fighters. Then you compare it with Click Here same there. top of the head/top of the ear for both figures. Parker looks slightly taller next to AJ than Dillian Whyte imo. He also looks slightly taller than Luis Ortiz did next to 6’4” listed Malik Scott- all supposedly 6’4” but Scott embarrasses them a bit. I suspect of the 3 6’4” listed contenders that they are all 6’2”-6’3” with Ortiz closest to 6’2” and Parker closest to 6’3”. One thing about Parker is he has never looked much short of his listing against previous opponents. For a tall guy he really forces posture in staredowns etc. Yes he looks a good 3 inches over Parker but you’ll never see a photo where the difference looks less. Obviously AJ is conscious of it and likes to make a point of the advantage. A 6'4" guy should look much taller compared to a 6'5.75" guy. @Gaz8, that picture has already been posted here on 19/Sep/17. Also i think Courtois is moore like 199cm. Plus we dont see their footwear, Courtois is s bit closer to the camera, etc.. It's just a picture among many others, where A.J. doesn't look quite 198cm. Doesn't prove anything. Anthony Joshua - 6ft 4in? There seems an inch between them in the photo. If A.J. is 198cm, then Hughie is 195,5cm. If A.J. is 197,5cm, then Hughie is 195cm. Parker is around 190cm. I struggle to see him 191cm. He looks moore than just 2cm shorter than Eddie Hearn, who is 193cm. Eddie is easily 3cm taller than Tony Bellew, who looks at least the same height as Parker does. Rob: What's your opinion on Joseph Parker's height? I'm thinking 6'2.5 based on the face off at the press conference yesterday. Parker doesn't really look 6ft 4, but 6ft 3 is quite possible. AJ looks 6'5-6'5.90. Under 6'6". Where's Joseph Parker's page? He's going to smash AJ. @Robbe - the photo with Hughie looks more than a flat 2" difference. Hughie at 196 and Parker at 190 - that's the closest I can give it from that photo, a full 6cm. Rob, did he look more 'imposing' than Tom Hopper? He does look like someone who would be in the 6'5.75"-6'6" range. Yes, he looks taller in person comfortably than Tom does....having a relatively 'high' eyelevel for his height helps Anthony. Can someone direct me to a picture of him where he looks 6'6 or close to that? I briefly looked at his instagram and there is the photo of him with Clarke being talked about below and one (Click Here) of him with listed 6'5 Okolie. To me he looks the same. Agreed. Sometimes a person can look way taller or shorter in a pic. So once again, Joshua is very close to 198cm. Maybe hair shorter. Well, the point was, you can allways find pictures where somebody looks shorter than expected, due to camera angles. Will's picture was just one example of many others. There are plenty of really good pictures to judge Joshua's height, and he appears allways at least 197cm tall. I would't be surprised if he's full 198cm. So really, its pretty pointless to post pictures where he looks noticeable shorter than 197cm. Cause he aint. @Robbe: I don't think the Haye pic is comparable to the Clarke pic. Haye is standing significantly closer to the camera than Joshua, whereas Clarke is not that much closer to the camera than Joshua is. I'm from the same town as Frazer Clarke, he's a full 6'6 (198cm). I don't know him that well and I've only seem him a few times at local boxing events (he is huge and towers everybody) but in his own words, he's a hair taller than Joshua, which makes sense as Joshua looks 6'5.5 most of the time. Who describes their height as 'imposing'? lol. But I concur Joshua IS 6'6" (Morning height with sneakers on). In the evening in barefoot I reckon he dips JUST under 6'5". The difference in that pic is way more than just 3cm. Haye has a big afro but you can tell by their eyelevel. @ Robbe - The angle favors Haye way more in his pic with Joshua than it favors Clarke in his pic with Joshua. Joshua is much further from the camera than Haye is (Joshua's head is pulled back / upright more, exaggerating this), not to mention haye's afro makes it deceptive. If Joshua crept forward slightly to hayes level I could still see maybe a 3.5inch difference. @Will, don't worry about it, it's just the camera angle. Just like in the pic below. David Haye is 187cm, so Joshua is 190cm? If Joshua is about 6'5 ( Which is what he looks with Rob- with a footwear Advantage no less) Parker is about 6'2.75. Joshua looks nearly 3" Taller than Parker in most of their Pictures. 6'4" Is pretty laughable for parker. He is lucky to get 6'2-3/4". I was stood behind Hughie fury in a queue last week, he was not as tall as I expected ? thought he would tower over me@ 180cm, seemed no more than 6ft3 but then again I'm not a great judge of heights. Parker was wearing shoes that give a little height advantage maybe. AJ wears trainers mostly. Parker could have been in dresser shoes. The difference between A.J. vs Parker is bigger than Hughie vs Parker. A.J. is 3in taller, Hughie only 2in taller. A.J. is 197-198cm, Hughie 195-196cm. I think Parker is 6'3.5, Hughie & Joshua both 6'5.5 an Haye 6'2. Given the size difference between Parker & Tyson Fury Click Here and Tyson and Hughie Click Here , I think Tyson needs an upgrade to 6'8 in all honesty. The height difference in the face off between Parker and Joshua looked basically identical to that of Hughie Fury and Parker. Therefore I'd say Parker is just over 6'3. Which seems about right from photos of him in the gym with David Haye where he looked about and inch and a half taller. Easily 3in taller than Parker in the face-off. Parker was in dress shoes, and Joshua in sneakers. So Parker is around 6'2.5". Around 6ft 3 might be possible for Parker, though I haven't looked that much at him really. How tall do you reckon Joseph Parker looked in the face-off? I'd say a good 6'3", maybe a fraction more. I reckon the pics showing Parker looking shorter/same height as Haye and Bellew were a bit deceiving. @ annonymous , Go to the Logan Paul page and click on the link someones posted of them meeting in Dubai. . AJ dwarfs him. The instagram pic is a good example of a misleading camera angle. I went to his instagram and there are pictures with Djokovic and Logan Paul that make me think he is shorter than listed. With Djokovic, who is listed at 6'1.5: Click Here We can't see footwear, but to me, Joshua looks only 3.5 inches taller. The picture with Logan Paul, also listed at 6'1.5, is very strange. Click Here Even if you take account for Joshua's bad posture, I think Joshua looks less than 3 inches taller. Perhaps Logan Paul is underlisted, but surely not by more than an inch. In the picture of him posted below with Zlatan and Bellew, he does look 6'6 compared to Zlatan, but he looks about 6'5 compared to Bellew (Accounting for Joshua wearing socks, not shoes). So I don't know what to make of that picture. My guess is that he's 6'5, dipping to 6'4.75 at the very end of the day, but I'm not confident. Hey Rob, how do you think Anthony is going to feel when he sees u knocked that 1/4 in off his height? @woody: well Rob met him in person so. Not to mention Wlad is lower 6’5 range and can barely see a difference with them at times. Joshua is very Impressive, tall and muscular but Really his in ring Movement pales in Comparison to smaller Heavyweights like Tyson and Holyfield. Honestly Wilder does move a lot more Fluently, Joshua gets gassed and appears sometimes lumbering and awkward. For anyone looking for Heavyweight fights better than Joshua/Klitz, Look up Ron Lyle vs. George Foreman. Holyfield vs. Bowe. They are tons. Klitz/Joshua was a good fight, not great. Still better than Any BS the little Midget Mayweather can put on. You better be Fast when you are 5'7 and 140 pounds. The rare occasion i would agree with Ice. Joshua isn’t 6’4. He’s minimum 197cm and 6’5.75 is a good shout. That guy Musternak must be taller than 183cm. That would make Bellew/Haye/Parker only 185-186cm. He seems to be little closer to the camera, or he is wearing lifts. That would explain the difference. Bellew should be at least 2in taller than Masternak. But Rob how are you so sure that he is .5 cm shorter than he claims and why would he claim .5 cm taller ? Editor Rob: well not everybody is going to sit on even inches. When someone isn't lying about their heights you get the rest of the bunch "outed"
@Joe - If Bellew is no more than 6'1 then that makes Haye around 6' flat or less, which is ridiculous. Bellew is 189-190. Joshua is at least 6'5.5 at worst, so taller than Ibra who is very likely somewhere around 6'4.5, not the full 6'5. Claiming that Tony Bellew is 6’1 (with no evidence) lol.. I’ve never seen him looking any less than a solid 6’2 and he almost always looks 6’2.5 as per his listing... There’s more chance of him being a very weak 6’3 than there is of him being 6’1. Obviously Ibra could be standing straighter, but it would give him an extra 1inch maybe 1.5inch at most, not 2.5 inches. Having said that, I’d say Joshua’s posture isn’t 100% either. It’s good, but he could probably gain another 0.25-0.5 inch if he really stretched out for that photo. Ibrahimovic is not standing straight in that picture, he'd be taller than Joshua. Sneakers might give him a full inch but not two, he's not wearing stilettos LOL Joshua on the other hand stands fully straight. Bellew is clearly not 6'2.5" more like 6'1" at most, and he's ridiculous in that outfit next to those guys. Bottom line I don't see Joshua taller than Ibrahimovic. Looks the same or shorter than Wlad Kiltschko. Yet Wlad claims 6 foot 5 and Joshua 6 foot 6. Rob, what do you think of him next to Idris Elba? Steve i think you are right. Joshua is at least 1inch taller than Zlatan without shoes and i think if Zlatan would wear no shoes Joshua would be taller by at least 2inches. But it shows in my opinion that Zlatan is no more than 6ft5 out of bed but if Zlatan is that height out of bed Joshua is for sure 6ft7 out of bed. But Rob is listing on his site people taller if he likes them as a Klitschko fan Joshua gets a downgrade by Rob and Zlatan as much as even possible so if Rob does not want to lose any credibility he has to change one of his listings because your link shows one of them is wrong. Just seen this photo which Tony Bellew has posted on his Instagram and I don’t see how anyone can argue that AJ is any less than 6’6 after this. We have 6’4.5 Zlatan Ibrahimovic on the left, who’s standing at minimum 6’5 in the trainers he’s wearing. And we have 6’2.5 Tony Bellew on the right, who’s standing at about 6’3 in his shoes. Joshua is wearing no shoes and yet is still at least 1inch taller than Zlatan at 6ft5 and has a good few inches on Bellew. How tall do you think Carlos Takam ( AJ next oponnent) looks? Vitali has claimed both 6'6 and 6'7 so it's possible he is 6'6.5. Honestly, 6'6.5 Helenius looks taller than Vitali, standing next to Wlad/Joshua. @Robbe: I think Vitali is a weak 6’7” honestly. Or shall I say could be a weak 6’7”. I can’t see him over 200cm back to back with Wlad honestly. 6’6.75. Maybe 6’6.5. His 6’7” is a height earlier in the day more than likely. 197 cm range weak 6’6. Fractionally under 6'6 is accurate. Met Eddie Hearn a few times, he's not quite 6'4 IMO. Maybe 6'3.75. 6'5 is him with his promotion hat on! Yh I met Eddie up close in person, I would be very surprised if he is under 6'4 he is very tall and actually pretty big built a lot bigger than I thought, Aj seems pretty relaxed when he stands going off with wlad etc pictures side by side can be deceiving because of that, I think the listing on here for Joshua is fair a weak 6'6 anything under 6'5.5 I wouldn't be sure of it. Eddie claims 6'5 but it might be his shoe height. I struggle to see him under 6'4 though. Very tall guy. Eddie Hearn is a very tall guy met him in person he does claim 6'5 not sure but he must be close maybe 6'4 range looking at him next to Anthony Joshua maybe he is 194cm I dont buy Joshua being 6'5 flat no chance he is taller than Lennox Lewis, 197- 198cm seems fair, Charles Martin was 6'5 not 6'4 will, Joshua was listed 1 Inch taller tho Joshua was at least an inch shorter than the 6'7 Dominic Brezeale. Wlad and A.J. are both quite a mystery, they look much taller than a legit 6'5 guys, but on the other hand, both look noticeale shorter than a legit 6'6.5 guys like Helenius, Wilder, and Courtois. It's really about centimeters what counts! Joshua is 197 cm i think. A bit taller than Wlad. 1-2 cm shorter than Courtois.